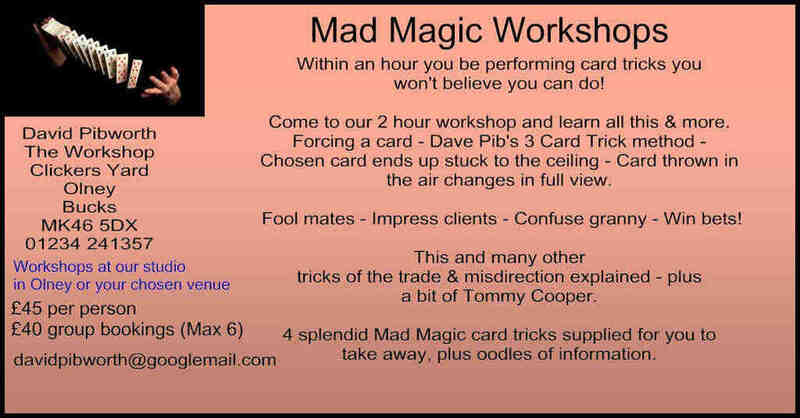 Kids like colour and action so card tricks are out during my Mad Magic shows. I do teach magic to youngsters at schools, but I don't really do a show as such, I explain the basics to them, and the objective there is to get them to think 'out of the box' and inspire them to be creative. I think that if you are going to entertain children through magic, you need to think seriously about what you perform, so this weekend I did just that. I try out all my magic on my 10-year-old daughter and take her comments seriously. Ok, she understands magic more than most 10-year-olds because she's been brought up with it, but that helps in some ways as she sees it from both sides. So the first thing is that they do like objects to disappear and reappear somewhere else immediately. Now this is relatively easy with playing cards but youngsters aren't as keen on playing cards as adults. There's a lot of other magic you can add in, but colour and action are all important. The other thing is not to underestimate their intelligence. I always talk to them as if they're adults. "You get far more from them that way." I always did that. Even when my daughter was in a carry cot, I used to go up to her and say "Good morning Esther, and how are you on this fabulous day" and tell her little jokes and snippets of information. She would grin and gurgle and listen far more than if I'd have gone up saying "Oooooh, who's a clever little girl ... oooooh, does she like her rattle ... ooooh". That's my view anyway, and it seems to hold up quite well, and I'm hoping that when I'm infirm and gurgling in the 'Newport Pagnell State Home for the Bewildered' she will remember me fondly. Anyway, there we have it. The Children's Show is coming along well and once I've perfected it, it'll be on the market and I'll be taking bookings ... so watch this space.